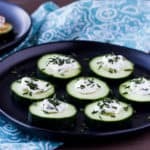 Mini Low Carb Cucumber Bites are an easy appetizer to make for any occasion! There is just something about Spring that makes me want all the cucumber and cream cheese snacks I can get! Maybe it’s the freshness of the cucumbers and herbs. Or, it could just be the lightness of this tasty combination. Whatever it is, I like it. 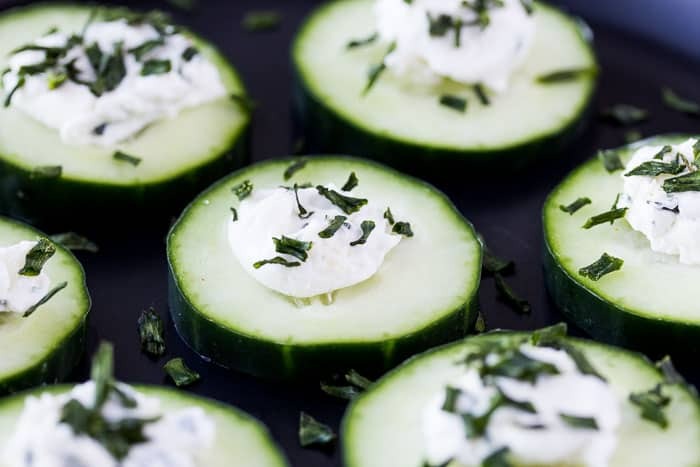 These Mini Low Carb Cucumber Bites are one of my favorite snacks. By not using crackers, they are naturally low carb and gluten free! I will make the herbed cream cheese ahead of time and store it in the refrigerator. Then, whenever I need a snack, I just cut a cucumber into slices and top them with a bit of the cream cheese. It’s so easy! Of course, if you are serving these at a party or gathering, you might when them to be a little fancier. Using a piping bag and tip, you can make the cream cheese “prettier, but it will need to be super soft. You can also use a small cooking cutter on the cucumber slices to give them fancier edges, if you wish, as well. You will want to set your cream cheese out ahead of time so that it can come to room temperature. This will make it so much easier to mix once you get started! Mince the chives, basil, parsley, and garlic. Peel the cucumber, if desired, and then cut it into 20 even slices. 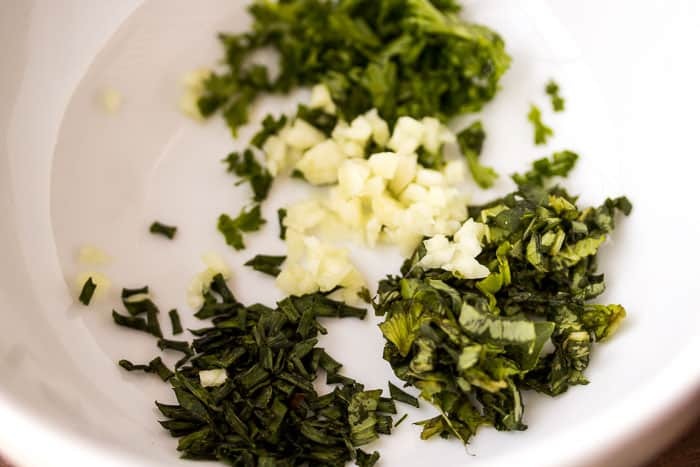 In a small bowl, add the cream cheese, minced herbs, and garlic. Mash everything together with a fork until it is well combined. Spread the cream cheese evenly onto all of the cucumber slices. Top with more fresh herbs and smoked paprika, if desired. I usually just set these out on a serving tray or pretty plates and sprinkle more fresh herbs around them. 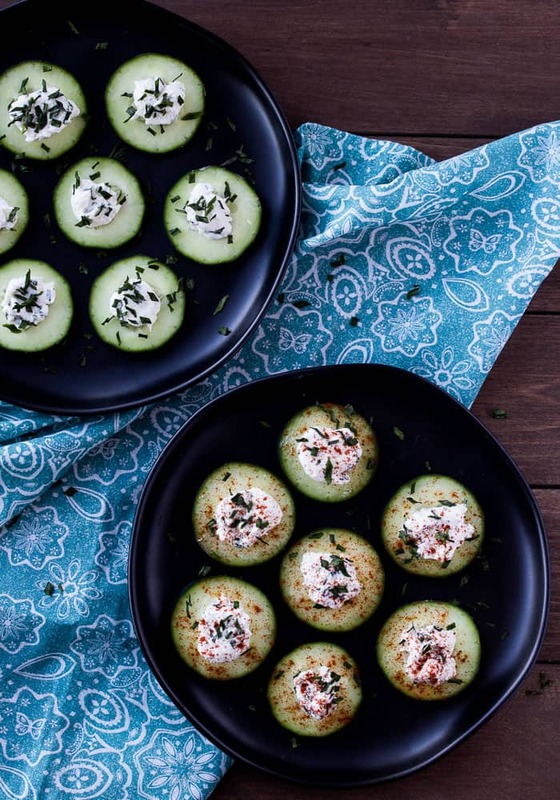 Love this Mini Low Carb Cucumber Bites recipe? Follow me on Pinterest, Instagram, and Facebook for more! 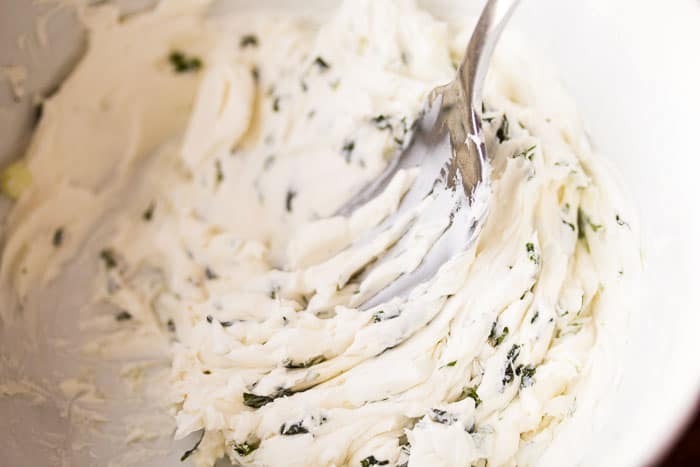 PREP: You will want to set your cream cheese out ahead of time so that it can come to room temperature. This will make it so much easier to mix once you get started! Mince the chives, basil, parsley, and garlic. Peel the cucumber, if desired, and then cut it into 20 even slices. 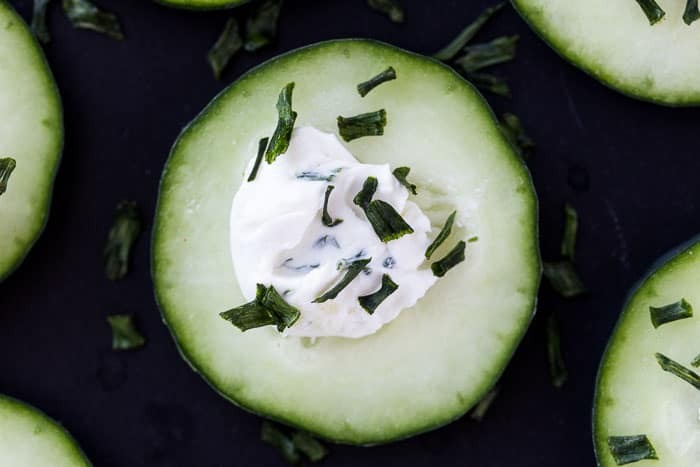 Spread the cream cheese evenly onto all of the cucumber slices. Top with more fresh herbs and smoked paprika, if desired. I love how simple these are and perfect for a party! Cucumbers and cream cheese are so good together, too! Love that this is low-carb and is a quick and easy to do snack! Thanks for sharing! I always love the cucumber and cream cheese combo! These sound delicious. Can’t wait to try them. Thanks for sharing! These sound so easy to make and delicious. Perfect appetizer or snack. And bonus low carb. Can’t wait to try these.